Last season, Lucas Giolito was concerned with staying in the Majors after each start. Now with the Chicago White Sox, he is in the right place to develop. One could certainly consider the Washington Nationals and Chicago White Sox to be polar opposites in terms of expectations this year. For the Nationals, anything less than a World Series berth may be considered a disappointment. Meanwhile, the White Sox are rebuilding, having unloaded Chris Sale and Adam Eaton while looking to retool their roster. It was that latter trade, sending Eaton to the Nationals, that brought Giolito to the South Side. A top prospect for the previous four years, Giolito bounced between the Nationals rotation and the minors. 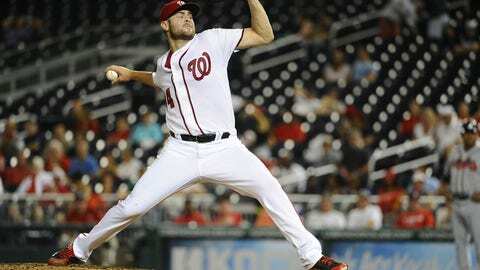 He struggled during his time with the Nationals, posting a 6.75 ERA and a 1.781 WHiP, issuing 12 walks while striking out only 11 batters in 21.1 innings. Although he pitched relatively well in the minors, his 2.87 ERA and 1.283 WHiP were not much of an improvement over the previous year. Some of the luster had worn off on Giolito’s star. As it turns out, the pressure of trying to perform on a team with playoff aspirations may have been too much for the young starter. He said that he regards his trade to the White Sox as “a breath of fresh air,” given how he was shuttled between the Majors and minors. While he understood that the Nationals could ill afford to let him struggle, that constant shuffling back and forth never allowed him to acclimate himself to the Majors. In fact, he worried that one bad outing would send him back to either Harrisburg or Syracuse. Now that he is in Chicago, Giolito can find himself once again. Now, if he struggles for an outing or two, that ride back tot he minors is not likely to be the immediate consequence. The White Sox believe that the former top prospect for the Nationals can be a key part of their rebuild, helping him get that confidence back. Giolito still showed some of those signs that made him a top prospect. In 115.1 innings in the minors last year, he struck out 116 batters while issuing only 44 walks. He certainly has the stuff to potentially dominate, but it is a matter of his being able to get everything together at the Major League level. Sometimes, all it takes is a change of scenery for that to happen. Giolito will finally get a chance to prove that he can handle a spot in a Major League rotation, and will no longer need to worry about keeping his place. Those inevitable growing pains can happen, and be a learning experience, instead of the reason why he is back riding the bus in AA. Next: Omar infante – center fielder? Lucas Giolito is ready to prove himself in the Majors. With the Chicago White Sox, he will get a legitimate chance.